Three times in the last two weeks, President Trump has turned in frustration from an intractable problem and landed upon an apparently elegant solution: the military. First it was Congress’s decision not to fund the president’s border wall in the omnibus spending bill. Trump twice tweeted that he wanted to “build WALL through M,” which most observers understood to mean “Mexico,” until The Washington Post revealed it actually referred to the military. Next came Trump’s idea to deploy the military to the border and provide security in the absence of a wall. In each of these cases, the attraction of military action for the president is clear. He has found his agenda largely stalled in Congress, where legislators have no interest in funding the wall or any other number of signature Trump projects, and the president has shown neither the interest nor the patience to lobby them. Even working through executive-branch processes has not produced the results that Trump wants, as courts have blocked some of his most treasured moves, especially his Muslim travel ban. The military, however, seems to offer something more akin to the experience that Trump enjoyed as the chief executive of a privately held company, where he could make a decision and see it quickly implemented. As commander in chief, he has authority over the military, and the military is, at least in theory, better equipped to respond quickly and efficiently to orders than the rest of the government. What each of these cases has shown, however, is that even the military doesn’t offer a frictionless tool for evading political and practical reality. Trump is hardly alone among presidents in turning to the Pentagon as a method of acting when other means wear out. Dog-wagging and jingoism make military deployments an alluring option for any president, especially one who is struggling in Congress, opinion polls, or both. President Obama became quickly enamored of drone strikes. President Clinton bombed the Balkans, Afghanistan, and Sudan. President Reagan invaded Grenada. Presidents at the ends of their terms tend to concentrate on foreign affairs, sometimes at the barrel of a gun, once they’ve achieved all they can domestically. What is unusual about Trump is how quickly he has landed on the military as his silver bullet, and the range of cases in which he has employed it. The prehistory of this impulse began before he took office. In assembling his team, Trump hired several retired generals, and he interviewed a range of current and former generals and admirals for top jobs. This seemed to serve a dual purpose. It both satisfied Trump’s appreciation for a martial aesthetic and for the majesty of a uniform, and it brought to him prospective lieutenants with a strong sense of can-do spirit and duty, unlike some of the civilians who had already written off working for Trump. The lesson must have been clear to Trump: Ordering military action gave him a chance to quickly and prominently produce results, and it would earn him praise from a press that otherwise detested him. Since then, he has become fond of talking up the power of the armed forces. Famously, Trump lobbed a vague but ominous threat of “fire and fury” at North Korea in August 2017, one of many times when he rattled the American saber in Pyongyang’s direction. These threats were more or less in the mainstream of American foreign policy, although he made them more explicit than other presidents, and it’s not clear the U.S. has any particularly attractive military option in North Korea. Less famous and much stranger was another August 2017 mention of the military. “We have many options for Venezuela,” he said. “And by the way, I am not going to rule out a military option.” This rattled many people. There had been no previous discussion of invading Venezuela, and for good reason: Although Caracas has often directed inflammatory rhetoric at the U.S., its economic and political crisis is a domestic one and poses no real threat to the United States. Trump quickly dropped any discussion of sending troops to Venezuela, but the abrupt threat would prove to be an augur of the three more recent cases. Each of them seems to have come about without much consultation with advisers, and each has quickly proven to be more complicated than the president must have hoped. The suggestion of funding the wall via the military apparently grew out of Trump’s anger at the omnibus spending bill, which did not fund the wall as he hoped. That bill did, however, increase military spending, which Trump celebrated and offered as a rationale for not vetoing the bill. Within days, he began his strange campaign to fund the wall through the Pentagon budget. As my colleague Priscilla Alvarez reported, it doesn’t really work that way. The defense budget is allocated to specific projects, rather than existing as a massive slush fund that the executive branch can direct as it sees fit, meaning that funding the wall would likely require congressional involvement. Of course, if Congress wanted to fund the wall, it would have done so in the first place. Hence the next idea: send the military to guard the border until the wall is built. Or something. Insofar as this has not been done, that’s because it may be illegal; insofar as it is legal, it has already largely been done. 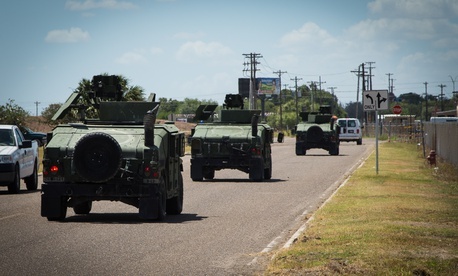 Initially, this appeared to mean the U.S. Army, but while the armed forces can assist in law enforcement, it’s not clear that a more or less permanent deployment to guard the border would be legal. What would be legal would be deploying the National Guard—and in fact Presidents George W. Bush and Obama did that on the border. Secretary of Homeland Security Kirstjen Nielsen on Wednesday indicated that’s what Trump intended to do. Such an action will require cooperation with state governors, who command and control the guard, and the troops can’t make arrests, act as police, or use force. In other words, it’s not the simple, unencumbered maneuver Trump intended. Wednesday morning, the White House released a tortured statement reconciling the two approaches, saying that on the one hand, the U.S. will stay until the mission is over, but that on the other it believes the mission will end soon. The simplest way to read this is that Trump spoke out of frustration about having troops on the ground, but was talked down by aides who convinced him he couldn’t simply yank them out on the spur of the moment. That’s the harsh reality that Trump is learning: It’s not easy to just uproot troops once they’re on a mission, just as it’s not as easy as just ordering troops to the border, or simply deciding that the Pentagon has enough billions around to build a massive wall. Superficially, it is simple to send the military in to solve a problem. In practice, however, domestic problems are just that, and no mobilization of U.S. Army divisions can patch over political divisions.